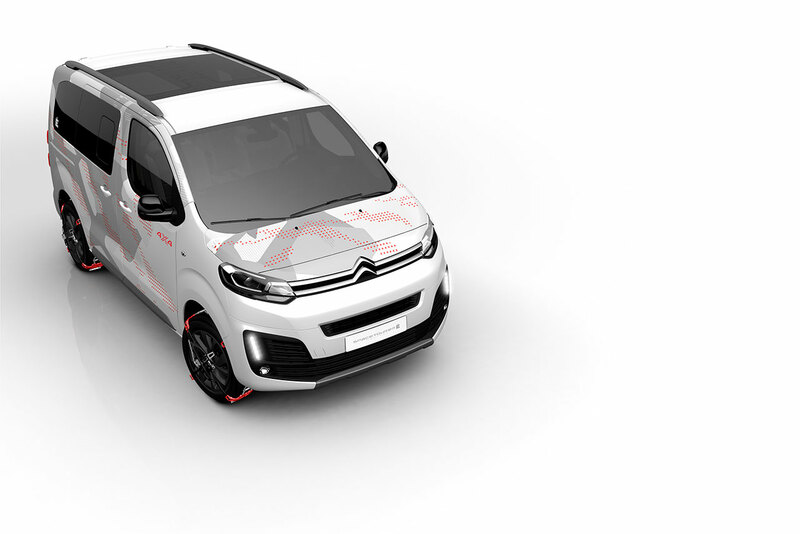 Citroën has revealed the SpaceTourer 4X4 Ë Concept, a contemporary vehicle with an uncompromising combination of off-road ability, versatility and comfort. The new concept is an up-to-date take on the SpaceTourer, uniquely inspired by Citroën’s "Ë" collection of limited edition lifestyle products. Enhancing the existing strengths of the production model, the SpaceTourer 4X4 Ë Concept offers elegant styling and a unique design, with class-leading technologies for all types of terrain – including an all-wheel-drive transmission developed by Automobiles Dangel. 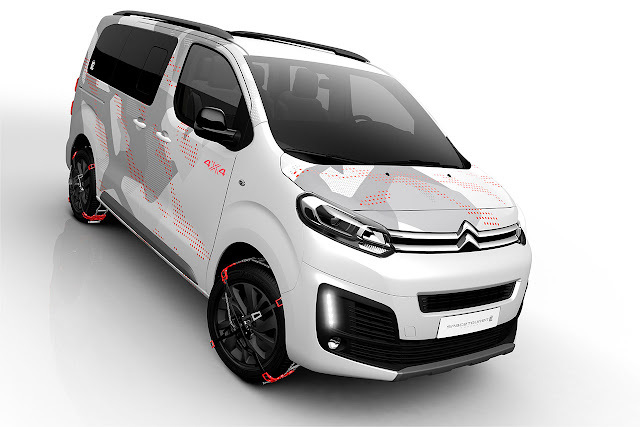 Citroën SpaceTourer 4x4 Ë Concept is designed for well-being, with adventurous styling that evokes vitality, making it ideal for families or groups of friends looking to enjoy leisure activities in style. 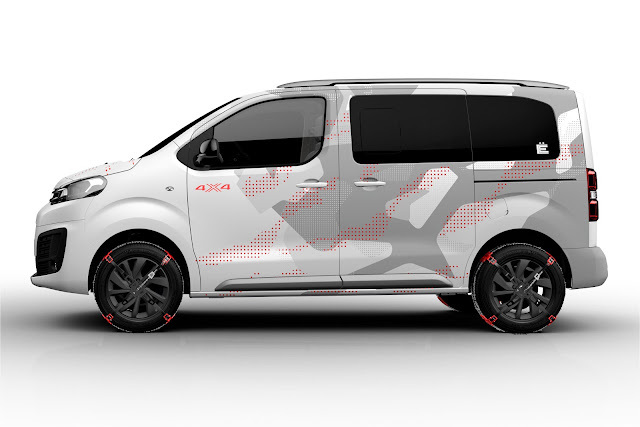 Aesthetically, the Citroën SpaceTourer 4X4 Ë Concept introduces a dynamic combination of colours and materials, both inside and out, with a striking graphic design for an energetic new look. Boasting all the best features of large MPVs and SUVs, the design emphasises the concept car's all-terrain abilities. The SpaceTourer 4X4 Ë Concept is equipped with special front and rear protective skid plates and roof bars with a satin aluminium finish. Recognisable with its "4X4" logo under the door mirrors and on the tailgate, the 4x4 concept also features tyres with snow chains. To visually boost its personality, the SpaceTourer 4X4 Ë Concept is cloaked in a special white paint and a striking grey camouflage design with red decals. Touches of the same red colour can also be seen on the snow chains. Available in several body sizes (XS, M and XL) to meet the needs of families and professionals alike, the SpaceTourer 4X4 Ë Concept is presented as a compact XS version, designed for top-level functionality and versatility. With its short wheelbase, the XS model is a first in its segment with a body length of just 4.60m and a height of 1.90m. Despite its raised body, the 4x4 version remains under 2m tall, ensuring access to most height-restricted car parks. The "Ë" signature is inseparable from the name and history of the Citroën brand, and is positioned proudly on the dark-tinted rear quarter lights. The SpaceTourer 4X4 Ë Concept’s sliding side doors open to reveal an impressively spacious interior, upholstered in soft and warm materials, with large windows providing plenty of natural light. The broad glass sunroof has two separate and coverable sections. The level of personalisation inside is most evident on the dashboard and upholstery. The red, white and blue colours are inspired by the "Ë" lifestyle product range and subtly celebrate the brands French heritage to forge a new interior aesthetic. 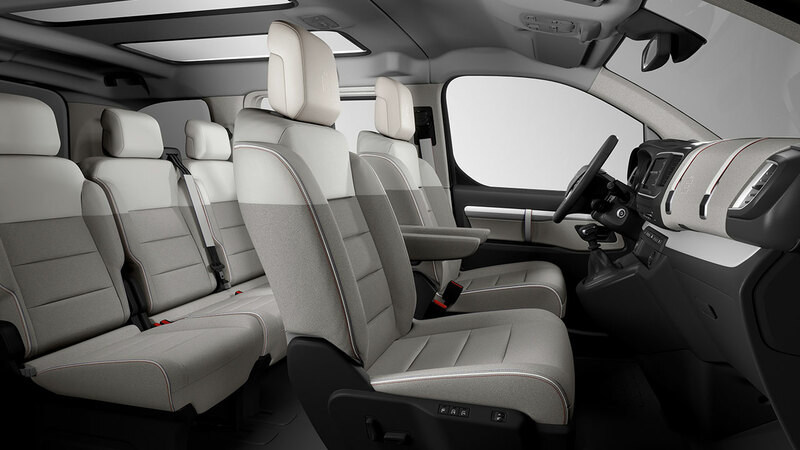 Inspired by the Citroën Advanced Comfort® programme, the seats in the SpaceTourer 4X4 Ë Concept are remarkably comfortable. The generous cabin can accommodate up to nine people, although in this five-seat configuration the concept has two individual front seats fitted with armrests. With an uncompromising combination of comfort, practicality and aesthetics, this concept car has a unique interior look with a top-quality two-tone treatment. White leather graces the upper part of the seat backs and headrests. On the lower two-thirds of each seat, mottled grey Alcantara and leather combine to create a stunning visual contrast. The headrests on the front seats feature an embossed “Ë” logo and there are white leather straps on the front doors for use as door handles. This type of design was first seen on the C4 Cactus and is inspired by the world of travel and leather goods. As with the seatbelts, these door straps feature the same red and blue detailing as the brand’s "Ë" lifestyle product collection. Other references to the “Ë” collection can be seen on the dashboard, which is decorated in a mottled grey, soft-to-the-touch fabric. This is similar to the iPad cover in the "Ë" collection. 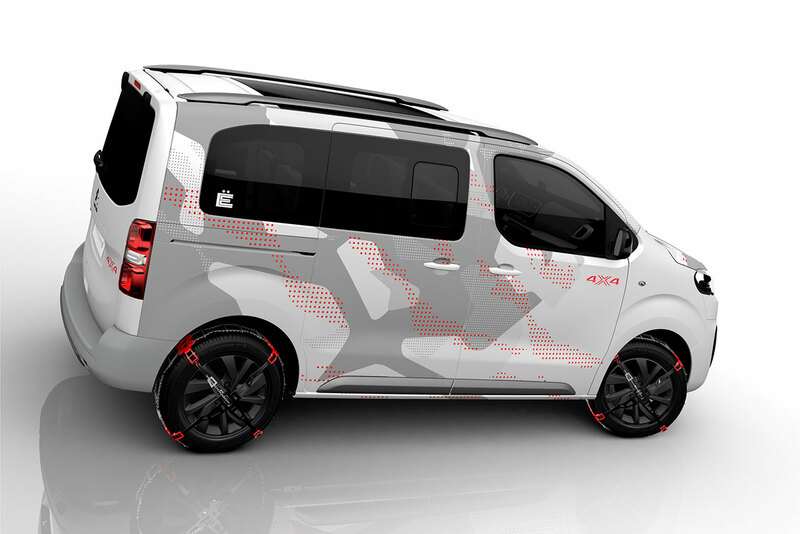 The aluminium-coloured trim in the cabin is a reference to the “Ë” branded jackets within the collection. The SpaceTourer 4X4 Ë Concept's adventurous spirit and raised ground clearance (60mm higher than the production model), make it the ideal companion for outdoor pursuits. Designed for most driving conditions, and powered by the BlueHDi 150 S&S diesel engine with a 6-speed manual gearbox, the SpaceTourer 4X4 Ë Concept boasts top-level all-terrain abilities and ride comfort, whatever the weather. 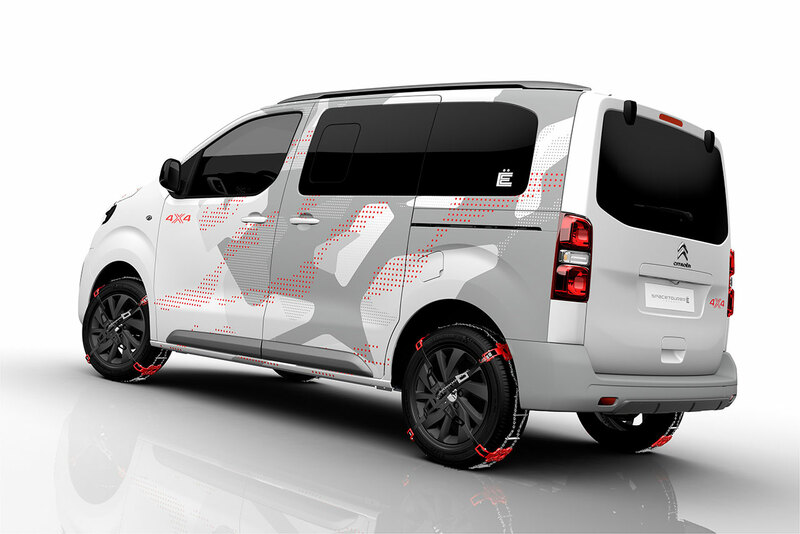 The concept is equipped with a selectable 4x4 transmission from Automobiles Dangel, a well-known French all-terrain specialist. Offering even greater motoring freedom, the drivetrain offers 4x4 traction, with Auto 4WD and R. Lock settings via a control wheel on the dashboard. 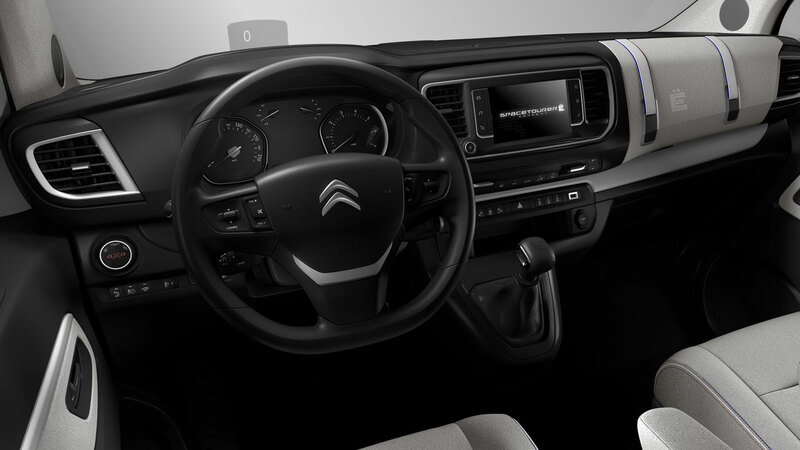 The Citroën SpaceTourer 4X4 Ë Concept has a high-set driving position and boot access is enhanced by the opening rear window in the tailgate. Cabin access is via two foot operated hands-free sliding side doors. Occupants are treated to 74-litres of storage space located around the cabin, including the glove box and door bins. There is also sufficient space in the back to house a snowboard, leisure accessories or other items from the "Ë" collection. The concept car has a load volume of up to two cubic metres in this five-seat layout.